A fully functional online donation system WordPress theme powered by Charitable plugin. XooThemes bring another new well-organized Charity WordPress Theme called Charitus for your site. So, what kind of theme it is? Are you an owner of an NGO? Are you a fundraiser through online? Do you run a charity campaign online? Well, then this new theme is for you. So this theme is a charity WordPress theme. So, let’s start from the very beginning. If you’re familiar with the WordPress functionality and web development then you’ll know about any WordPress theme. You might already be known to the WordPress and WordPress themes. But let’s see the brief walkthrough. WordPress is a renowned content management system which can be used for website or blog building. Nowadays, website creation is no longer a critical matter at all. A Rich website doesn’t only contains rich contents but also includes mind-blowing designs. So, to create a well-designed website, you definitely need a perfect theme. There’re tons of WordPress themes are available. Themes are the combination of colors, fonts and other options to design a website and blog. Many themes are available in many categories. Charity WordPress theme is one of those categories. So what is a charity theme? The Charitable plugin has so many premium add-ons which allow you to extend the donation/fundraising features. Recurring Donations and Front-end Campaign Submission can be done using the premium extensions. This theme comes with all Charitable premium extensions support. Login to check Campaign submission system. This theme comes with WooCommerce and The Event Calendar support. By using this theme you can create an online store or an event site as well. Recurring Donations, Front-end Campaign Submission by Using Extensions. What is Charity WordPress Theme? XooThemes has brought an entirely new Charitus theme for you all. Before we talk about charity theme, we should know about the charity website. Charity site deals with non-profit Government organization, donation and fund raising programs. Charity WordPress theme is the perfect match for a charity-based site. So, hopefully now you know the purpose of a charity theme. So, how does Charitus work actually? There’re so many amazing features. The user-friendliness of Charitus is undoubtedly the one of the finest. This theme is powered by Charitable plugin. This theme has all the necessary features you want. One can easily start a donation campaign within a few minutes. The theme also includes Give – Donation and Fund Rising Platform plugin. You can give this feature a try by using the Demo. There’re so many premium add-ons comes with this theme. Premium extensions are also available with the theme. Recurring donation and front-end campaign submission can be done through these extensions. So, initially what are you getting with this theme? Charitable Plugin: It has all common features what a Donation / Fundraising site should be. You can create a donation campaign in a minute. It’s very easy-to-use, user-friendly, it has payment gateway support, fundraising campaign support, comes with amazing extensions, it works with any theme and much more. Give – Donation and Fund Rising Plugin: Give is one of the highest rated, most downloaded, and best supported donation plugin for WordPress. It’s has been built with all the useful features for all your fundraising needs, Give provides you with a powerful donation platform optimized for online giving. It has complete donor management, powerful donation form, easily customizable and much more. Fully Functional Donation System Integrated: This charity WordPress theme has fully functional donation system integration. The entire donation system is very flexible enough to make the entire process quite easy. The donation system is very fast performing, easily customizable and workable. The whole donation system is really great to use and the usability also very clean. Charitus also provides The Donate menu, it is built to fundraise for the whole site in which you can see ID, name, date, payment method & status for donations and information about donors or “Add new”. Moreover, the setting part is very smart with detailed settings on General, Email, Check Out and Donate to decide how they will be displayed in the front-end area. Create Charity Campaigns/Projects/Causes: Creating charity campaigns are very easy with this Charity WordPress theme called Charitus. The donation system integration makes this theme quite friendly and usable. The Campaigns menu from Charitus is made for separated plans/ projects that you want to call for donation. With every campaign, you can set up Goal & Raised, Compensate amount. Besides that, it is very easy to add a new campaign, categories or tags like a regular post for Campaigns. In the front end, there’s a “Donate Now” button will be displayed when you just hover the mouse, it helps your campaign to raise crowdfunding better. Charitable and Give plugins are the key to make this theme run successfully. You can easily make a campaign within a couple of minutes. Sounds great. Isn’t it? Donation Progress Bar for Campaign to Keep Track of Donation: As you already know that campaign creation is undoubtedly easy. Now after creating the campaign, what else you should do? Well, tracking the campaign and donation. 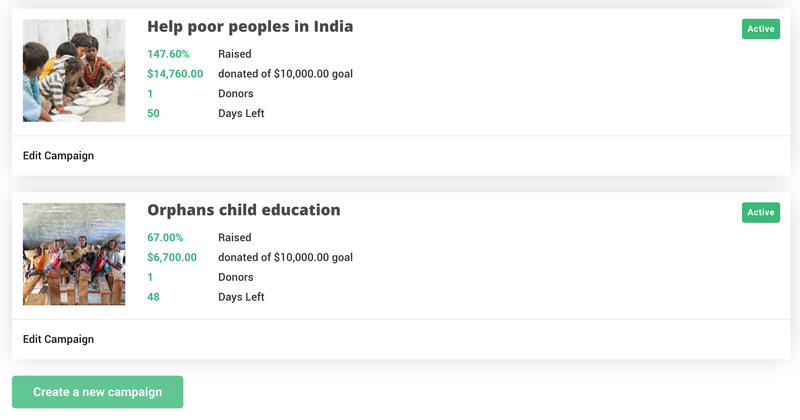 You can easily track the entire campaign process and donation through the donation progress bar. A progress bar is a very smart feature of this Charity WordPress Theme. It shows you donation’s status of a campaign and you can take information of campaigns quickly and precisely. Because that, you also can build a plan to create a campaign and change them reasonably. Tracking the campaign is now easy. Layouts and fonts: There’re so many layouts and menu options are available with Charitus. You’ll be able to modify multiple pages through this charity WordPress theme. Multiple layouts allow you to choose layouts whenever you want necessarily. There’re multiple fonts are also available that allows you to choose your favorite fonts whenever you want. Charitus is, fortunately, the one charity WordPress theme you’re looking for. Donation Statics Short Code: There’re well-organized shortcodes to manage the entire donation process such as donation form, donation campaign, and other processes. Shortcodes can keep the entire workforce run just fine. Donation static shortcodes are really important to make the whole donation process, campaign and donation scale clean and fast. The shortcodes are truly organized for sure. Ajax Donation Campaign Search: If you run multiple donation campaigns then it’d be a little hard for the users to find out all the campaigns or the desired campaign. Therefore, Ajax donation campaign search makes the full process easy. As a user, you can search for any campaign through this feature. So, nobody will get confused in terms of a searching campaign to donate. WordPress Fundraising Toolkit: Fundraising work is the importance of a charitable site or campaign. To run a successful fundraising campaign Charitus has included all the necessary fundraising toolkits you can expect. Fundraising toolkit is important to manage, customize fundraising process of your website with ease. Create Donation Campaigns in Less Than 5 Minutes: You can easily create donation campaigns through the Charitable plugin very easily. It has all common features what a Donation / Fundraising site should be. You can create a donation campaign in a minute. It’s very easy-to-use, user-friendly, it has payment gateway support, fundraising campaign support comes with amazing extensions, it works with any theme and much more. Powered by Charitable Plugin: Charitus is a Charitable-powered theme. It has all common features what a Donation / Fundraising site should be. You can create a donation campaign in a minute. It’s very easy-to-use, user-friendly, it has payment gateway support, fundraising campaign support comes with amazing extensions, it works with any theme and much more. Recurring Donations, Front-end Campaign Submission by Using Give Extensions: Give is one of the highest rated, most downloaded, and best-supported donation plugin for WordPress. It’s has been built with all the useful features for all your fundraising needs, Give provides you with a powerful donation platform optimized for online giving. It has complete donor management, powerful donation form, easily customizable and much more. Full Responsive and Clean Design: We’ve seen some great features of Charitus but we have not focused on the main part yet. The responsiveness of this theme. The theme itself is highly responsive, fast and user-friendly. The design is also very clean and eye-catchy. It has some fantastic layouts, menus and some gorgeous colors. The theme is totally colorful and attractive to those who always look forward to make a stylish website. So, why are you even waiting for? Give it a try. Easy to Customize Drag and Drop Builder: Charitus offers the most versatile drag and drop page builder option for everyone. Some pre-sales questions arise when it comes to the Visual Composer page builder. None of the bestselling premium WP themes use this heavy page builder, and neither do we. Charity WP uses the most popular, lightweight and powerful Drag & Drop page builder Visual Composer Page Builder. The theme loads much faster because of this smart decision. Everyone knows that Google loves a fast loading website. So, Charitus can your perfect choice to build a fast responsive charity website. W3 Valid Code and Theme Checker Passed: All the codes are W3 validated and very well-organized and well-commented. Codes are always an important part of any theme. If the codes are messed up then the theme will not work that much great as expected. XooThemes offers the fast responsive Charitus theme with impressively coded features. WooCommerce Support: WooCommerce is the heart of online business as we already know. No buying and selling can be done without WooCommerce plugin. Charitus offers the most flexible WooCommerce support option for all the users around the world. Donating is very easy with Charitus. WooCommerce support makes this Charity WordPress theme very dependable and easily manageable. Fully WPML & RTL Support: It is really easy to bring your charity site to a global market because Charity WP theme fully supports multi-languages with WPML, Polylang, and QTranslate. Moreover, the theme also supports RTL (Right-To-Left), to handle and respond to users who communicate with a right-to-left language. So, it’s understandable that the feature is really awesome. Amazing One Click Demo Importer: Charitus charity WordPress theme comes with an amazing one click super easy demo data importer. This fantastic feature will make the theme installation process for all the users straight out of the box. All you have to do is Just go to WP Admin > Appearance > then choose Import Demo Data, and then you’re absolutely ready to start. It’s easy to install the demo right? SEO Friendly: Charitus is a great way to get your charity website ranked significantly higher on search engines. This charity WordPress theme will let all titles, headings, and metatags have been carefully optimized, just the way that Google likes it. Structured Data is implemented deeply, to make your site look appealing in Google search results. We have not only coded for blog posts, but for WooCommerce products and campaigns/causes/projects too. 24/7 Dedicated Support and Documentation: After starting with the Charitus, what else you need to take care of? The customer support part. If you face any trouble using Charitus charity WordPress theme, XooThemes is promising to provide the finest customer support for the users. Whenever you face any problem, just let us know the thing you’ve been facing and then leave it to us. We’ll do our job. So, this is the Charitus for you. Overall, this charity WordPress theme is very beautiful, user-friendly, responsive and very fast. It has all the ideal features you a user can ever ask for. If you’re looking for a charity theme then don’t be late and get Charitus right now! It’s truly a worthy theme for you.